After a day of reasonably high speeds and easy sailing, at 1600 UTC today the Leg 6 lead changed again when CAMPER with Emirates Team New Zealand (Chris Nicholson/AUS) regained pole position followed by sparring partner Abu Dhabi Ocean Racing (Ian Walker/GBR). After separating earlier in the leg, with CAMPER and Abu Dhabi Ocean Racing taking a route close to the shore, PUMA Ocean Racing powered by BERG (Ken Read/USA) choosing the middle road, and Telefónica and Groupama, who are struggling to keep pace with the Spanish boat, taking the offshore option, the courses of the five boats are beginning to fuse once more. Tonight they are picking their way across a permanent and stationary cold front, a 50-mile wide area of storms that has produced a 180-degree wind shift and is now throwing out a much lighter north westerly breeze. As the fleet tacks back and forth around the thunderclouds, separation has started to reduce and at 1900, 30.4 nautical miles (nm) covered the fleet from CAMPER in first place to Groupama in fifth. Telefónica (Iker Martínez/ESP) and Groupama (Franck Cammas/FRA) are still offshore, intent on covering each other and guarding their positions of first and second in the overall rankings. PUMA who took the lead briefly earlier today, in fourth place on the overall scoreboard, are free to sail their own race, while CAMPER and Abu Dhabi, just 0.4 nm apart, have steered away from the coast and are racing towards the outriders and take on the challenge of the storm area. The frontal line is light and fluky and just one cloud can rain on the parade of any of the teams and shake up the leg leaderboard up dramatically. The next 12 – 24 hours will be something of a lottery until the first boat reaches the northern edge, however all are confident in the positions they have chosen as they work their way towards Cabo Branco, the easternmost tip of Brazil, 650 nm or so ahead. “We’re fairly happy with our position. At this stage we wouldn’t swap positions with the guys inshore and we are fairly comfortable with where we are,” said PUMA navigator, Tom Addis. “Traditionally, from here on up, once you pop on out into the trade winds on the northern side, being east is the thing that is worthwhile, and we are west of our opposition. 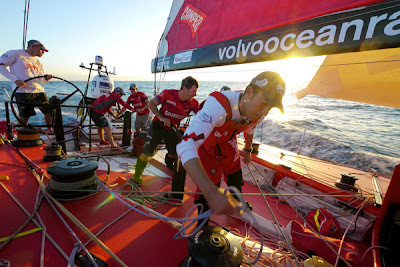 We are going to try to keep working east and hopefully, when the music starts again on the other side, we will be far enough east to lay Recife in the north of Brazil,” explained Will Oxley, navigator of CAMPER. “I’m happy with our eastern position,” said Groupama navigator Jean-Luc Nélias. “It’s a bit more logical and I feel it’s less hazardous than the course taken by Abu Dhabi and CAMPER,” he added. There is at least 100 nm of tricky sailing to complete before the fleet punches through the front and reaches the reasonable breeze on the other side, when the winners will be easy to see and the not so lucky will be searching hard to find a passing lane.